Same great salsa packaged in 4 single serving cups which is nearly equal to one 16 oz jar but in convenient, reduced waste, single serving containers saving on shipping weight. Same great salsa packaged in 4 single serving cups which is nearly equal to one 16 oz jar but in convenient, reduced waste, single serving containers saving on shipping weight. Huevos rancheros, enchiladas, chile con queso, meatloaf and green chile stew are family favorites with El Pinto Medium Red Chile Salsa. Just remove the foil top, warm and let your imagination run wild. 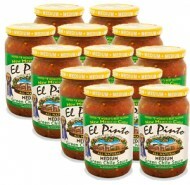 For the flavor of New Mexico it's got to be El Pinto Medium Salsa! INGREDIENTS: TOMATOES (PEELED TOMATOES WITH JUICE, CALCIUM CHLORIDE, CITRIC ACID), ROASTED GREEN CHILES, JALAPENO PEPPERS, SEA SALT, GARLIC. Same great green chile sauce packaged in 4 single serving cups which is nearly equal to one 16 oz jar but in convenient, reduced waste, single serving containers saving on shipping weight. 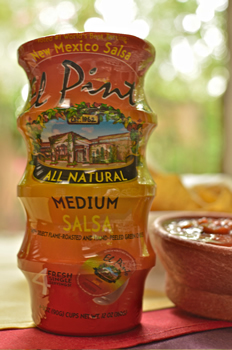 Chill and serve El Pinto Medium Salsa for best flavor. Great on any meat, eggs, fish or chips!